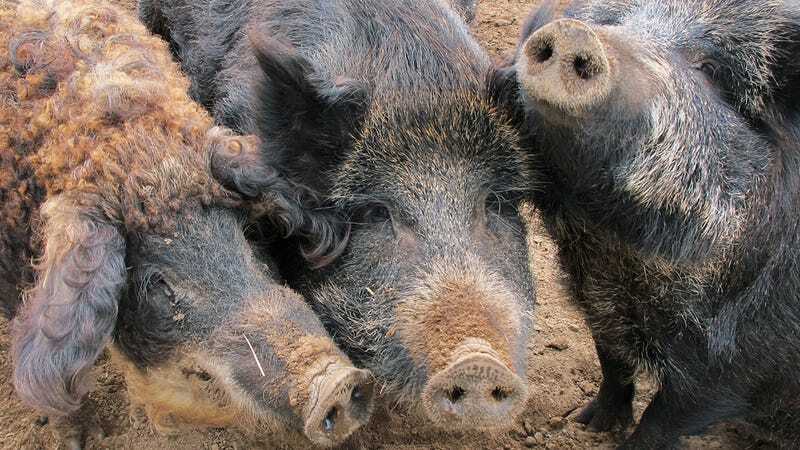 Texas’s 2.5 million feral pigs may soon fall victim to chemical warfare. On Tuesday, the state’s Agriculture Commissioner Sid Miller changed the rules of the Texas Administrative Code to permit the legal poisoning of these unsuspecting hogs. The agent of this impending apocalypse? Kaput Feral Hog Lure is a bait food laced with warfarin, a colorless and flavorless rodentcide. In smaller doses, warfarin is also used as a blood thinner in humans. Warfarin holds particular significance in world history—a study from 2003 suggests it might’ve been used to poison Stalin during his last dinner with the Politburo, and President Eisenhower was an early user of the drug, which he was given after a heart attack in 1955. When the hogs eat, they’re going to drop crumbs on the outside, where small rodents can get them and not only intoxicate themselves but also birds of prey that eat them. Since the poison will be on the landscape for weeks on end, the chances of these birds eating multiple affected animals is pretty good. “Chemical feral hog apocalypse” joins “President Donald J. Trump” and “fried chicken shell tacos” in the list of absurd realities that, in simpler times, seemed utterly impossible.